Why not upgrade the Bradley? And what could its replacement look like? Maj. Gen. Brian Cummings, PEO, Ground Combat Vehicles, talks about the cuts to Bradley upgrades and how that fits in with the development of next generation combat vehicle programs at AUSA. WASHINGTON — The modernization team tasked with advancing the Army’s next-generation combat vehicles is focused, as its top priority, on replacing the Bradley Fighting Vehicle with an Optionally Manned Fighting Vehicle, according to the team’s leader, Brig. Gen. Ross Coffman. The OMFV is meant to “provide options to commanders in combat, so it’s a decision to, manned or unmanned, gain contact with the enemy, and that can be visual or through firepower, and it actually provides options to commanders so that they can use the best way to accomplish their mission,” Coffman said in an interview with Defense News shortly before the Association of the United States Army’s annual meeting. The Next-Generation Combat Vehicle Cross-Functional Team — established as part of the Army’s new Futures Command — tackles the service’s second highest priority out of six major lines of effort that are intended to fully modernize the force by 2028. The CFT has had many conversations with industry to determine what’s possible. The team has laid out what it thinks will be the requirements for the vehicle, Coffman said, including aspects like an optionally manned capability, loading it on a C-17 aircraft, protection elements and lethality. Even though the Army plans to rapidly prototype and procure the OMFV, Coffman said the team will continue to roll new technologies in through constant experimentation, in parallel with OMFV procurement, so that the first OMFV that comes out and gets fielded is constantly improved. The Army will roll those improvements into manufacturing “so that we can always maintain the current technology on these vehicles,” he said. The Army is requesting that designs have lots of room for upgrades and to add in new technology. "We know technology will continue to move at the pace it is today or faster, and it is going to allow us to have enough physical space and computing power as well as propulsion power that, if we want to add things to these vehicles, we have the ability to build them [to be] the best they can be,” Coffman said. Jumping right in, the service plans to release a request for proposals, not just a draft, by the end of the year, Coffman said. It is anticipated that the proposals will be due in May next year, and then the Army will downselect to two competitors who will build 14 prototypes in an engineering and manufacturing development phase in the first quarter of fiscal 2020, according to industry sources. Coffman said he hoped to cast a wide net with industry, including looking to partners around the world for solutions. “We want them to bring us their best, and we will evaluate and downselect to some number and do a procurement contract at the end of the final evaluation,” he said. To accommodate for the OMFV effort and the other lines of development within the CFT’s portfolio, the Army has downgraded its prototype activity within the Army’s Tank Automotive Research, Development and Engineering Center. 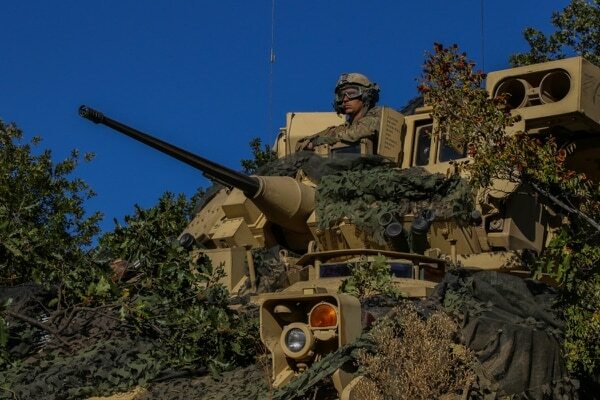 A year ago, the Army had kicked off a major prototyping effort to develop what the service was calling its NGCV by awarding an industry team a contract to build two demonstrators by fiscal year 2022. The Army awarded a seven-year, $700 million contract to a team consisting of SAIC — the team lead — as well as Lockheed Martin, Moog Inc., GS Engineering Inc., Hodges Transportation Inc. and Roush Industries. Jim Scanlon, senior vice president and general manager of SAIC’s Defense Systems Group, told Defense News in a recent interview that while the initial plan was to build prototypes, the strategy has evolved. Now, the team is working on sub-system experimentation for TARDEC using Bradley assets, to test capabilities such as mobility systems and manned-unmanned teaming. SAIC, according to Scanlon, sees the Mobile Protected Firepower solution it is hoping to prototype for the Army as possessing technological capabilities that will serve as “hooks” — or a pathway — to fulfilling OMFV requirements. Other companies are likely to emerge with offerings for OMFV, including General Dynamics Land Systems, AM General and BAE Systems. BAE Systems brought its CV90 fighting vehicle, developed for the Swedish army, to AUSA. The Netherlands, Finland and Denmark are also customers of the vehicle. According to BAE, it brought the CV90 to the show as a starting point to discuss possible options for the NGCV program. Raytheon and Rheinmetall announced at the AUSA conference Oct. 8 that they are partnering to provide Rheinmetall’s Lynx combat vehicle as its submission to the impending OMFV competition.